Bacterial communities play a crucial role in the biology, ecology, and evolution of multicellular organisms. In this research, the microbiome of 24 selected beetle species representing five families (Carabidae, Staphylinidae, Curculionidae, Chrysomelidae, Scarabaeidae) and three trophic guilds (carnivorous, herbivorous, detrivorous) was examined using 16S rDNA sequencing on the Illumina platform. The aim of the study was to compare diversity within and among species on various levels of organization, including evaluation of the impact of endosymbiotic bacteria. Collected data showed that beetles possess various bacterial communities and that microbiota of individuals of particular species hosts are intermixed. The most diverse microbiota were found in Carabidae and Scarabaeidae; the least diverse, in Staphylinidae. On higher organization levels, the diversity of bacteria was more dissimilar between families, while the most distinct with respect to their microbiomes were trophic guilds. Moreover, eight taxa of endosymbiotic bacteria were detected including common genera such as Wolbachia, Rickettsia, and Spiroplasma, as well as the rarely detected Cardinium, Arsenophonus, Buchnera, Sulcia, Regiella, and Serratia. There were no correlations among the abundance of the most common Wolbachia and Rickettsia; a finding that does not support the hypothesis that these bacteria occur interchangeably. 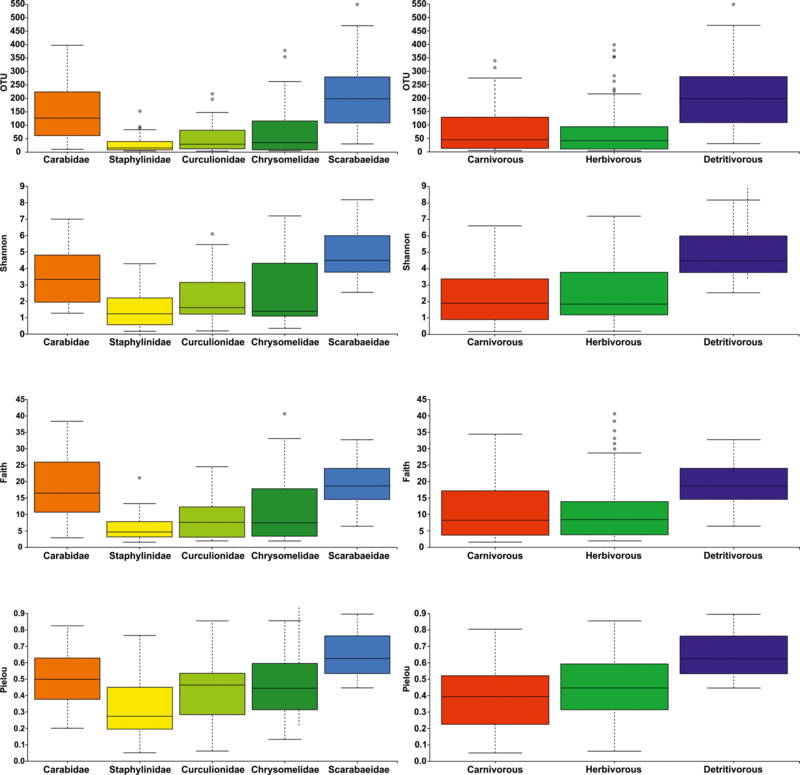 The abundance of endosymbionts only weakly and negatively correlates with diversity of the whole microbiome in beetles. Overall, microbiome diversity was found to be more dependent on host phylogeny than on the abundance of endosymbionts. This is the first study in which bacteria diversity is compared between numerous species of beetles in a standardized manner. The online version of this article ( https://doi.org/10.1007/s00248-019-01358-y) contains supplementary material, which is available to authorized users. Multicellular organisms share an inextricable and mutualistic relationship with a large number of resident microorganisms, collectively known as the microbiota (microbiome) . Nowadays, microbiome is considered one of the most important factors that shapes the life history of its hosts. Naturally, the best studied animal in the context of the relationship between microbiota and host is the human (e.g., ) and model organisms (e.g., [3, 4, 5, 6]). In contrast, microbiome diversity and relations with hosts have rarely been investigated in the context of wild animals, but this is quickly changing thanks to the development of new sequencing technologies and their decreasing costs. Thus far, the majority of microbiome studies in relation to hosts have been conducted with vertebrates (e.g., [7, 8, 9, 10, 11]). It is assumed that the complexity and diversity of the symbioses of bacteria and invertebrates (particularly insects) are lower than those associated with vertebrates . Simultaneously, the influence of bacteria on insect hosts should be similar. It has been proven that some organisms may have a significant influence on the composition of hosts microbiota: parasites , symbionts , or endosymbionts . While interaction between host and parasite or symbionts are well-studied and documented [16, 17], scientists have only begun to clarify the relationship with endosymbionts. One of the most thoroughly examined groups of microbes are endosymbiotic bacteria belonging to so-called male-killing bacteria . Endosymbiotic bacteria are a specific group of organisms that are known first of all to influence host reproduction. Several intracellular bacteria are known to have such an impact on their hosts. The best known are two genera of α-proteobacteria: Wolbachia and Rickettsia. Others, such as Spiroplasma (Mollicutes) and Cardinium (Bacteroidetes), are much less studied [19, 20, 21, 22]. Wolbachia have been reported as being found in arthropods and filarial nematodes around the world [23, 24]. Rickettsia also seem to be a common bacterial symbiont of arthropods ; they can manipulate host reproduction in arthropods through various mechanisms (see [18, 26] for the review). Moreover, Wolbachia may be an obligatory bacteriocyte-associated nutritional mutualist , which highlights a previously unknown aspect of the parasitism-mutualism evolutionary continuum. Although we have begun to better understand the importance and function of microbiota, the relationship between the diversity of microbiome and traits (both phylogenetic and ecologic) of their host remain understudied topics. Due to richness of species, well-studied taxonomic relationships, and a relatively low complexity level of microbiota, insects seemed to be the perfect choice for such studies. Actually, the relationship between host taxonomy, trophism, and microbiota has already been the subject of meta-analysis . Nonetheless, the latter work summarized previous studies, which caused numerous limitations. The study did not allow for a full elaboration of the topic. First of all, because Colman’s work was based on meta-analysis, examined data could not be standardized. Secondly, that unintended sampling caused an overrepresentation of insect species from some orders (e.g., Hymenoptera); also, some trophic guilds were highly underrepresented (e.g., carnivorous and herbivorous). For example, coleopterans were included as representatives of Cerambycidae, Buprestidae and Scolytinae (xylophagous), Carabidae (carnivorous), and Tenebrionidae (omnivorous), but most of these groups were represented by single species. Third, the number of examined specimens per species was various but generally too low for proper estimation of microbiome diversity. Finally, this study was done before 2012, the period in which capabilities of molecular tools were limited and therefore, all bacteria sequences were generated using traditional Sanger sequencing in conjunction with molecular cloning. This could cause several biases, mainly leading to underrepresentation of microbiome diversities. An interesting study by Yun et al. examines microbiome of more than 300 insect species with use of next-generation sequencing (NGS). This study focused on a wide coverage of hosts with very low sampling per species (mostly single specimens were used), which prevented any intraspecific analyses and allowed for comparison of microbiomes only on high taxonomic levels. Studies by Colman et al. and Yun et al. develop interesting topics, but to fully address relations between microbiota and their insect hosts, more detailed and restricted research are needed. For the purposes of this study, beetles were selected: this group gives numerous opportunities to study various relations between microbiome and hosts of various phylogenetic relations and ecological affinity. Beetles are the most species-rich and diversified order of insects in the world, including approximately nearly 400,000 known species . They can be found in most terrestrial and freshwater habitats. Members of Coleoptera belong to all major trophic guilds known in animals. Despite such complexity and diversity, knowledge of microbiota in this group of insects is limited. So far, microbiome has only been examined in single species belonging to one of the trophic guilds: detritivores–coprophages [31, 32], scavengers , xylophages or cambiophages [34, 35, 36, 37, 38], herbivores [39, 40, 41, 42], as well as carnivores [43, 44, 45]. Complex analyses concerning diversity of microbiota in relation to beetle phylogeny (taxonomy) and ecology (e.g., trophy) has yet to be conducted. The only well-studied bacteria of beetles are endosymbiotic “male-killing” bacteria, particularly Wolbachia , which additionally makes Coleoptera a good group to choose for microbiome studies. The aim of this study was to use NGS to characterize the microbiome composition of 24 beetle species belonging to three trophic guilds (detritivorous, herbivorous, carnivorous) and five families (Carabidae, Staphylinidae, Chrysomelidae, Curculionidae, Scarabaeidae). This part aimed to verify whether microbiota composition is more similar within the species than between hosts (H1) and was assessed on two levels: that microbiome is similar in beetles belonging to the same taxonomic unit (family) (H2) or trophic guild (H3). Secondly, we established whether infection by endosymbionts (mainly Wolbachia and Rickettsia) could influence composition of microbiome to verify the hypothesis that the presence of endosymbionts correlates with microbiota diversity (that an increased number of endosymbionts decreases number of other bacteria) (H4). Additionally, we checked if an abundance of endosymbionts are negatively correlated with each other in order to verify the hypothesis that particular genera of these bacteria occur interchangeably (H5). For the purposes of this study, 24 species of beetles were selected. Beetle species were chosen based on the following criteria: (i) taxonomic position, (ii) trophic assignment, and (iii) status of endosymbiotic bacterial infection (based on previous studies). The first and second categories were partially related, as in beetles most taxonomic units (e.g., families or genera) are strictly associated with a particular diet and foraging mode (e.g., the majority of Carabidae are carnivorous). We decided to analyze three basic trophic guilds known in beetles, that is: (1) carnivorous, (2) herbivorous, and (3) detrivorous (specifically coprophagous) species. Among carnivorous, members of two groups were selected: Carabidae (ground beetles) and Staphylinidae (rove beetles). Among herbivorous species, two groups were also selected: Curculionidae (weevils) and Chrysomelidae (leaf beetles). Finally, all detrivorous species were recruited from Scarabaeidae (dung beetles). To omit biases, which could be potentially caused by different habitat preferences, foraging, or distribution of sampled species, selected beetles (within trophic guilds and taxonomic units) were selected from species of similar habitat and food preferences. For example, all carnivorous (Carabidae and Staphylinidae) were required from riparian beetles, all herbivorous (Curculionidae and Chrysomelidae) from grassland species, and all detrivorous (Scarabaeidae) from coprophagous species associated with wild and domestic mammals. Considering restrictions of next-generation sequencing, the total number of specimens planned to be analyzed (200) were divided between taxonomic groups (families) and trophic guilds. In species selection, the third criterion was also included: infection status by endosymbiotic bacteria, particularly Wolbachia. Infection status was based on previous research with use of genotyping by multilocus sequence typing  (details in: [47, 48, 49, 50]). Half of the species from each group (each family and each trophic guild) was selected to be infected by Wolbachia; the second half had to be uninfected. Finally, 24 beetle species were selected. For 16 species (four ground beetles, four rove beetles, four weevils and four leaf beetles), 10 specimens per species were randomly selected from the collection of beetles from Europe preserved for molecular studies in the Department of Collections Institute of Systematics and Evolution of Animals, Polish Academy of Sciences in Krakow. The remaining eight species of dung beetles were sampled on five random specimens each (the lower number of specimens was due to fewer sampling of beetles belonged to this group (difficulties in sampling larger number of specimens in the field). Details related to sampling (taxonomic affinity, trophy assignment and Wolbachia infection status of selected beetle species with number of analyzed specimens) are presented in Table 1. DNA was isolated from 200 specimens belonging to 24 species of coleopterans using The Wizard Genomic DNA Purification Kit (Promega). Prior to isolation, all beetle specimens were surface-bleached in distilled water. Isolation was conducted in blocks with two blank samples for each block to rule out contamination with bacterial DNA. DNA was used within a few hours after isolation and then stored at − 20 °C. All laboratory procedures were carried out in accordance with the Earth Microbial Project protocol (http://www.earthmicrobiome.org/protocols-and-standards/16s/). The V4 region of the 16S SSU rDNA was amplified with 515FB-806RB primer pair: forward: GTGYCAGCMGCCGCGGTAA; reverse: GGACTACNVGGGTWTCTAAT  with the addition of an index sequence unique for each specimen and Illumina adaptor. PCR was performed using the following steps: 94 °C for 3 min and 35 cycles of 94 °C for 45 s, 50 °C for 60 s, and 72 °C for 90 s with a final extension of 72 °C for 10 min. Blank samples were run on agarose gel along with samples with DNA isolates. Since blank samples did not show any products on the gel, they were excluded from further procedures. PCRs with DNA of all samples were repeated three times to avoid batch effect . Subsequently, three samples per specimen were pulled together and run on a 2% agarose gel with a 100-bp ladder to check for amplification efficacy. Samples were pooled equimolarly based on the intensity of the bands. The next pool of samples were run on gel through electrophoresis. Afterward, bands of desired length were cut out from the gel and cleaned with the Zymoclean Gel DNA Recovery Kit (Zymo). Concentration of the library was measured with Qubit and sequenced with Illumina MiSeq platform (600 cycles) using the MiSeq Reagent Kit v3. Demultiplexed paired-end fastq files generated by Illumina and a mapping file were used as input files. Sequences were pre-processed, quality filtered, and analyzed using QIIME2 version 2018.2 . The DADA2 software package within QIIME2 was used for modeling and correcting Illumina sequenced fastq files including the removal of chimeras using the “consensus” method. Due to a drop of quality scores sequences were truncated 40 bases from forward and 70 bases from reverse reads (with Phred score 25 as a threshold). For taxa comparison, relative abundances based on all obtained reads were used. The QIIME2 q2-feature-classifier plugin were used. The Naïve Bayes classifier that was trained on the SILVA132 99% OTUs full-length sequence database and subsequent sequences from our dataset were assigned to OTUs from SILVA database with similarity on the 99% level. To view the taxonomic composition of the samples, the QIIME2 taxa bar plot command was used. Next, all unassigned sequences were excluded from further analysis. Alpha and beta-diversity analyses were performed with the q2-diversity plugin in QIIME2 at a sampling depth of 2000, which was based on rarefaction curve. Alpha diversity was calculated by Shannon’s diversity index (hereafter Shannon), observed OTUs (hereafter OTU), Pielou’s measure of species evenness (hereafter Pielou), and Faith’s phylogenetic diversity (hereafter Faith). For description of the particular bacteria present in higher number of reads in analyzed beetles, bacterial OTUs were pulled to the level of genus (or any higher taxonomic rank if lower classification was not possible), e.g., all OTU classified as Wolbachia were considered jointly, etc. Beta diversity was estimated with use of unweighted UniFrac (hereafter uwUniFrac) and weighted UniFrac (hereafter wUniFrac), Bray–Curtis distance (hereafter Bray–Curtis), and Jaccard distance (hereafter Jaccard). Basic statistics showing means, ranges and standard deviations of these indices were calculated for all examined species separately, as well as for families and trophic guilds. Differences in alpha diversity indices between groups of beetles on three levels—(i) among species from particular family, (ii) among families, and (iii) among trophic guilds—were statistically assessed with use of Kruskal-Wallis test (for which all the assumptions have been verified), which was next visualized in QIIME2. Beta diversity was compared between groups using principal coordinates analysis (PCoA) with pairwise comparisons (PERMANOVA) and visualized with the emperor plugin in QIIME2. The bacterial communities associated with three levels of grouping were ordinated, according to microbiome composition similarity, using the distance-based non-metric multi-dimensional scaling (NMDS) . The differences among the bacterial communities associated with three levels of differentiation (species, family, trophy) were estimated by a nonparametric one-way analysis of similarity (ANOSIM) . 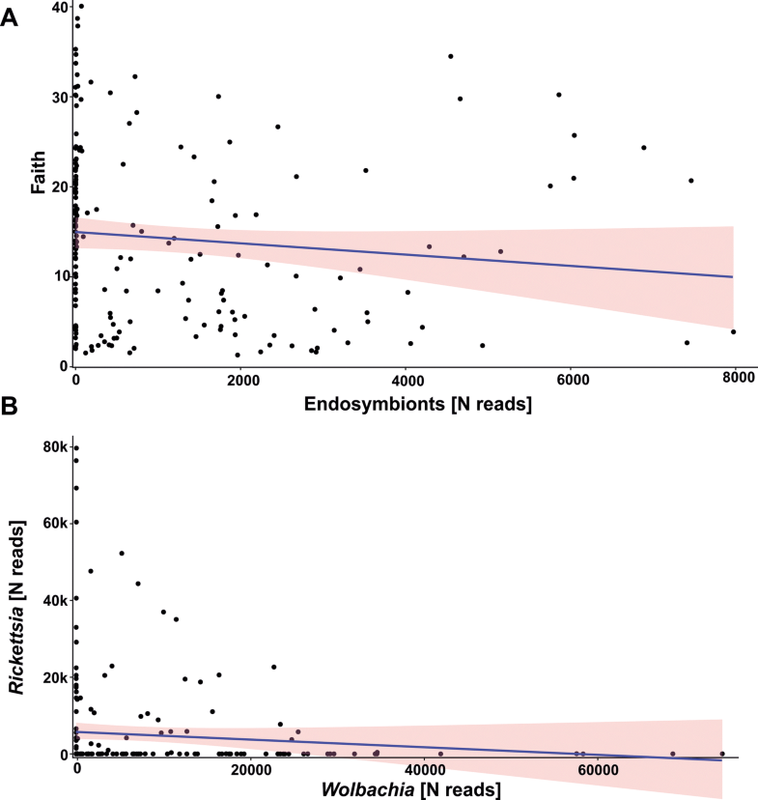 Moreover, endosymbionts abundance was correlated with modified alpha diversity indices. Abundance was expressed by number of reads found for Wolbachia and Rickettsia, as only these taxa were found to be numerous in obtained microbiome sequences. To avoid biases caused by self-explanation of microbiome diversity by the endosymbiont prevalence parameter (as endosymbiotic bacteria constituted a large part of bacteria in many samples), all reads belonging to Wolbachia and Rickettsia were removed from datasets before calculation of modified alpha diversity indices in this step of analyses. Additionally, correlations between number of reads found for all identified endosymbiotic bacteria were also calculated. Abovementioned correlation were also repeated on only presence–absence data of particular endosymbiotic taxa. Due to the simplicity of analyzed dataset of beetle hosts (24 species from only five families and three trophic guilds), a high correlation between these three levels of sample assignment (species, family, and trophy) was observed (Rho = 0.98 between species and family, Rho = 0.95 between family and trophy, and Rho = 0.93 between species and trophy). This ruled out the possibility of any multivariate analyses on these three states of host assignment. However, the effects of host phylogenetic relations and abundance of endosymbionts on overall diversity of bacteria was estimated with use of generalized linear models (GLMs). Host phylogenetic relations were expressed by use of genetic distances (adopting Kimura-two parameters as the substitution model;  calculated from sequences of cytochrome oxidase gene, subunit I (coxI) obtained from beetles (data from ), hereafter Distance. Endosymbiotic bacteria prevalence was measured as a summarized number of 16S reads assigned to any bacteria from genera known as to be endosymbiotic for insects (see “Results” for details), hereafter Endosymbionts. Explained variable (microbiome diversity) was taken from QIIME2 calculations of alpha diversity (four separate GLMs were analyzed for Shannon, OTUs, Pielou, and Faith). To avoid biases caused by self-explanation of microbiome diversity by endosymbiont (this concern most abundant Wolbachia and Rickettsia) prevalence parameter (as endosymbiotic bacteria constituted a large part of bacteria in many samples), all reads belonged to endosymbiotic bacteria were removed from dataset before calculation of alpha diversity indices. Models were next ranged according to Akaike information criterion (AIC) and AIC weights (w) following recommendations of Burnham and Andreson . Statistical analyses (except these from QIIME2) were executed in R package . After quality control, we obtained a total of 9,320,053 demultiplexed sequences from 200 specimens of 24 beetle species belonging to five families and three trophic guilds (Suppl. Table 1). The mean sequence frequency was 46,600.3 per specimen (median 31,316.0, min 0.0, max 368,452.0 per specimen). Five specimens (one Paederidus rubrothoracicus, one Bembidion decorum, and three Centricnemus leucogrammus) were excluded in this process. After rarefaction on average, for most of specimens, 2000–4000 Illumina reads of 16S sequences were obtained; however, these values varied greatly (Table 2). The number of OTUs obtained from collected reads also varied greatly between particular beetles, but on average, 80–140 OTUs were observed per species (Table 2). Due to the high number of bacteria taxons within samples (Fig. 1, Suppl. Fig. 1), the descriptive part of results was focused on only bacteria, which OTUs were found in abundance (for at least one half of individuals from particular host species) higher than 5% (Suppl. Table 2). Occurrence of endosymbiotic bacteria (particularly Wolbachia, Rickettsia, and Spiroplasma) is described in following chapter; the descriptions below concern only other bacterial taxa. Regarding ground beetles, more than 5% of the reads were found for one OTU of Enterococcus (Bacilli) in Bembidion punctulatum, one OTU from family Comamonadaceae (Betaproteobacteria) in B. punctulatum, two OTUs from Enterobacteriaceae and two OTUs from Pseudomonas (both Gammaproteobacteria) in B. punctulatum, one Orbus OTU (Gammaproteobacteria) in all Bembidion species and unidentified Proteobacteria OTU in B. modestum (Suppl. Table 2). Among rove beetles, one OTU of Flavobacteriaceae (Flavobacteriia) was abundant in Paederus ruficollis, one Leptotrichiaceae OTU (Fusobacteriia) was found in P. rubrothoracicus, two OTUs of Enterobacteriaceae (Gammaproteobacteria) were present in P. rubrothoracicus, one OTU from order Pseudomonadales (both Gammaproteobacteria) infected all rove beetle species (Suppl. Table 2). In weevils, one Sphingomonas OTU (Alphaproteobacteria) was found in C. leucogrammus, Pantoea OTU (Gammaproteobacteria) was numerous in C. leucogrammus and Eusomus ovulum, and one OTU from family Enterobacteriaceae (Gammaproteobacteria) was found in Argoptochus quadrisignatus (Suppl. Table 2). Regarding leaf beetles, one OTU of Sphingomonas (Alphaproteobacteria) was found in Crioceris duodecimpunctata, Comamonadaceae OTU (Betaproteobacteria) was present in Aphthona venustula and C. duodecimpunctata, and Enterobacteriaceae OTU (Gammaproteobacteria) was found in A. venustula (Suppl. Table 2). Among dung beetles, in all eight species, three Acinetobacter OTUs (Gammaproteobacteria) dominated. Moreover, the following bacteria reached 5% in some hosts: Empedobacter OTU (Flavobacteriia) in Aphodius sphacelatus, Solibacillus OTU (Bacilli) in A. pusillus and Onthophagus ovatus, Carnobacterium OTU (Bacilli) in A. sphacelatus, Enterococcaceae OTU (Bacilli) in A. sphacelatus, Ruminococcaceae OTU (Clostridia) in A. depressus and O. taurus, Neisseriaceae OTU (Betaproteobacteria) in A. sphacelatus, Enterobacteriaceae OTU (Gammaproteobacteria) in O. similis, Pasteurella OTU (Gammaproteobacteria) in O. ruficapillus and unidentified Gammaproteobacteria OTU in A. sphacelatus (Suppl. Table 2). Microbiome alpha diversity differed significantly among samples in all three levels of grouping (species, family, and trophic guild), and it was observed for all four metrics (OTU, Shannon, Faith, and Pielou) (Table 3, Suppl. Table 3a, Fig. 2, Suppl. Fig. 2). Among ground beetles, the highest microbiome diversity was found in B. decorum and B. punctulatum and lower in B. modestum and Bembidion varicolor. P. ruficollis had the highest microbiome diversity among all rove beetles with other three taxa of similarly lower metrics of diversity. In weevils, C. leucogrammus possessed most diverse bacteria, followed by E. ovulum, Polydrusus inustus, and A. quadrisignatus. Two sister species of Crioceris leaf beetles had totally different diversity of microbiome with C. duodecimpunctata of much higher diversity of bacteria. Also, A. venustula had much more diverse microbiome than Cheilotoma musciformis. Among dung beetles, most species were characterized by high diversity of bacteria, and only A. sphacelatus had very low microbiome diversity (Table 2, Suppl. Table 3a, Suppl. Fig. 2). On the level of the beetle family, there were substantial differences in diversity of bacteria. Overall, the highest diversity of microbiome was observed for Scarabaeidae and next for Carabidae. Lower diversity was found for Chrysomelidae and Curculionidae and the lowest for Staphylinidae (Table 2, Suppl. Table 3a, Fig. 2). Obviously, a similar pattern was observed for beetles grouped into trophic guilds, with highest diversity of bacteria found for detritivores and lowest diversities observed in herbivores and carnivores (the latter was caused by joint measuring of diversity of bacteria rich ground beetles and bacteria of poor rove beetles) (Table 2, Suppl. Table 3a, Fig. 2). All four metrics of beta diversity (Bray–Curtis, Jaccard, wUniFrac, and uwUniFrac) resulted in consistent results. However, distances between beetle hosts were found to be different depending on the level of species grouping: species, families or trophic guilds (Table 3, Suppl. Table 3b, Fig. 3, Suppl. Figs. 3, 4). Regarding microbiome similarity between particular species of beetles, most hosts belonging to the same taxa did not cluster into distant groups from other members of either the same family or trophic guild. Microbiomes found in individuals of beetles generally were intermixed and only rarely did some beetle species separate from others (Suppl. Table 3b, Suppl. Fig. 3). In Carabidae only B. varicolor formed a separate unit; however, single individuals of this species seemed to have microbiome more similar to B. decorum or B. punctulatum. Among Staphylinidae and Curculionidae, no species formed distinct units in respect to their microbiota. In Chrysomelidae, 8 out of 10 specimens of Crioceris quatuordecimpunctata were found to be weakly different. Also, in Scarabaeidae, four out of five specimens of A.sphacelatus were separated from all other specimens from this family (Suppl. Table 3b, Suppl. Fig. 3). If considering trophic guilds, no beetle species formed clustered separately in carnivorous, herbivorous or detrivorous (Suppl. Table 3b, Suppl. Fig. 3). Quite opposite patterns were found when analyzing beetles in groups. On the level of families (Table 3, Suppl. Table 3b, Fig. 3, Suppl. Fig. 4), the most distinct microbiome was found to have dung beetles. Also, ground beetles and rove beetles formed partially separate groups with some overlap between species from these two groups. The only exceptions seemed to be Curculionidae and Chrysomelidae, members of which intermixed in respect to distinctiveness of their microbiota. The abovementioned patterns resulted in much more visible distinctiveness of microbiomes found in hosts belonging to particular trophic guilds (Table 3, Suppl. Table 3b, Fig. 3. Suppl. Fig. 4). All three guilds (carnivorous, herbivorous and detrivorous) formed separate groups, with detrivorous most distant to all others. 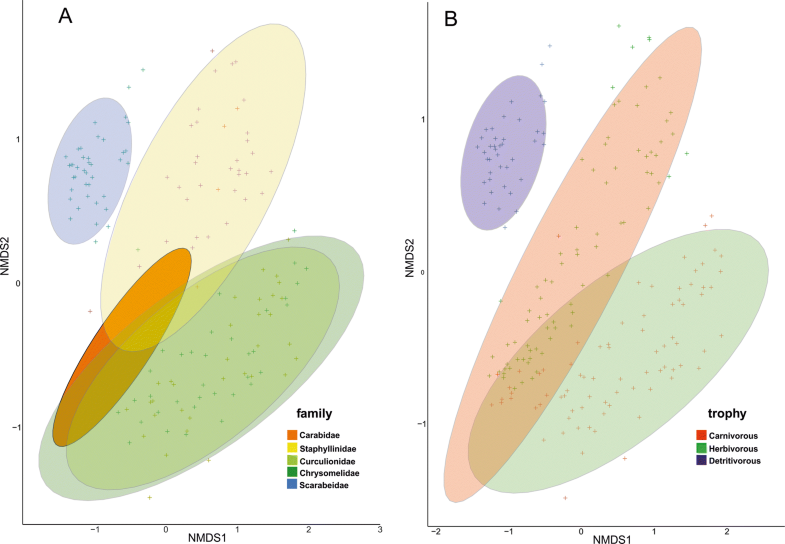 ANOSIM revealed significant differences of microbiome similarities on all three levels of grouping (ANOSIM R = 0.837, P = 0.001 for species; R = 0.693, P = 0.001 for families and R = 0.590, P = 0.001 for trophic guilds). This was also supported by NMDS plots, which show that microbiome of beetles from particular trophic guilds and families are generally different with some exceptions (e.g., weevils and leaf beetles; Fig. 4). Less obvious pattern was observed for species level, as numerous beetles overlapped in NMDS plot (Supp. Fig. 5). 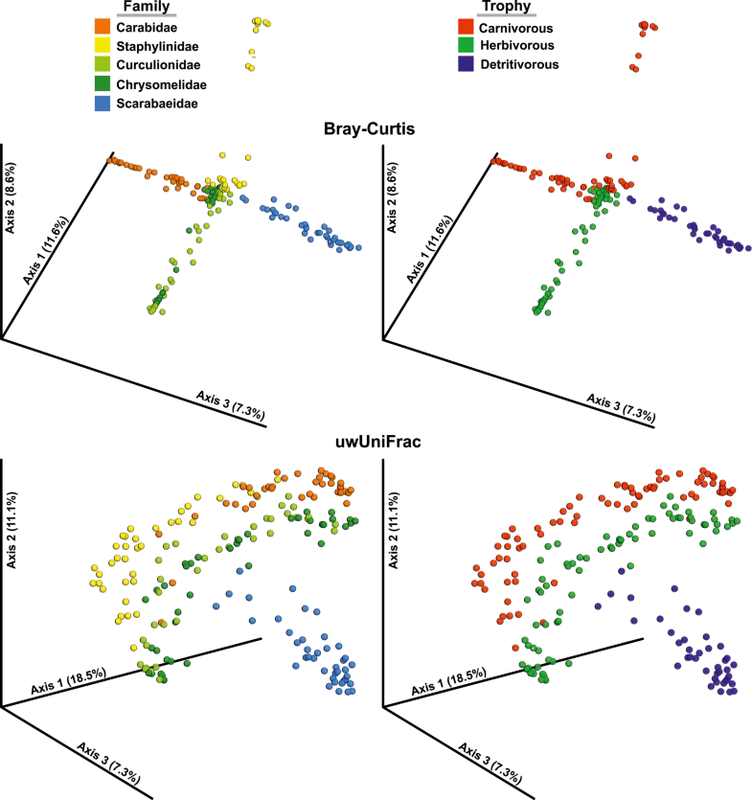 Non-metric multidimensional scaling plot of Bray-Curtis dissimilarities between microbiomes found in beetle individuals belonged to particular families (a) and trophic guilds (b). Ellipses = 95% confidence intervals. In total, nine taxa of endosymbiotic bacteria (including five from the male-killing group) were observed in examined beetles (Table 4). The most abundant were found to be Rickettsiales with the highest share of Wolbachia and Rickettsia. Wolbachia was the dominant bacteria (in respect to number of obtained reads among the whole microbiome) in B. punctulatum, B. varicolor, P. limnophilus, Paederus riparius, P. ruficollis, A. venustula, C. quatuordecimpunctata, A. quadrisignatus, E. ovulum, P. inustus, A. haemorrhoidalis, O. similis, and O. taurus, in 13 out of 24 examined species. Three distinct OTUs were identified for Wolbachia. Their occurrence was generally host species-specific, but there are also cases in which two OTUs were present in the same species and even individual. In all such cases, one OTU over-dominating other (see Suppl. Table 1 for details). Rickettsia was most abundant in B. decorum, B. punctulatum, P. limnophilus, C. musciformis, A. quadrisignatus, E. ovulum, and P. inustus, in 7 out of 24 examined beetles. In four species (B. punctulatum, P. limnophilus, E. ovulum, and P. inustus) both these bacteria were found in high prevalence (Table 4). Two OTUs of Rickettsia were present in analyzed beetles, and one of them was found in much higher number of reads (see Suppl. Table 1 for details). Contrary to Wolbachia, cases with two OTUs present in the same species and individual were rare. Spiroplasma found be much less numerous (in respect to Illumina reads), but it was found in quite large numbers in the following beetle hosts: P. limnophilus, P. riparius, P. inustus, and in lower number in, e.g., B. decorum, C. quatuordecimpunctata, A. sphacelatus (Table 4). There were four OTUs of Spiroplasma in the whole dataset, but one of these units was over-dominating and was found in the majority of beetle hosts with the exception of predatory species (see Suppl. Table 1 for details). Similarly, as in Rickettsia, there were almost no cases with multiple units present in the single species and individual. Other six taxa of endosymbiotic bacteria, only small number of reads in single hosts were found, such as: Cardinium (in B. varicolor); Arsenophonus (in P. limnophilus); Buchnera (in A. venustula, C. duodecimpunctata, A. quadrisignatus, C. leucogrammus, E. ovulum, A. depressus, A. pusillus, O. ruficapillus); Regiella (C. duodecimpunctata, E. ovulum); Serratia (P. ruficollis, C. leucogrammus, O. ruficapillus); and Sulcia (C. quatuordecimpunctata, E. ovulum). Only for Buchnera were four OTUs identified. All other endosymbiotic bacteria were represented by a single OTU found in all infected beetles (see Suppl. Table 1 for details). There were no significant correlations among number of reads of these endosymbiotic bacteria, with the exception of Buchnera and Regiella (Rho = 0.45 if consider number of reads and Rho = 0.50 for presence/absence data) as well as Buchnera and Wolbachia (Rho = − 0.17 only if considering number of reads). For the two most abundant endosymbiotic bacteria, i.e., Wolbachia and Rickettsia, no correlation was found (Rho = 0.04, p > 0.05 if consider number of reads and Rho = − 0.02, p > 0.05 for presence/absence data; Fig. 5a). Regarding the endosymbiotic bacteria, their total number of reads significantly but very weakly and negatively correlated with alpha diversity of other bacteria in beetle hosts (Rho = − 0.21 for OTU, Rho = − 0.18 for Shannon, Rho = − 0.20 for Faith, and Rho = − 0.17 for Pielou Fig. 5b). If consider presence/absence data, significant but weak correlations were observed only between alpha diversity metrics and Rickettsia and Buchnera (e.g., Rho = − 0.29 and 0.21 for Faith, respectively). All other endosymbiotic bacteria were not correlated with any of alpha diversity metrics. For three out of four alpha diversity metrics (Shannon, Faith, and Pielou), the model which was found to have the lowest AIC and highest AIC weight was that which included both explanatory variables, that is: Distance and Endosymbionts (Table 5). Only in the case of OTU, “the best” model included only Distance. However, in other GLMs (with the exception of Faith), the second model had AIC weight lower from the best model of less than 2, what according to Arnold  did not allow for recognizing which of these models better explained microbiome diversity. In all GLMs, the model with the lowest AIC weight included only Endosymbionts (Table 5), what indicated that abundance of endosymbionts was a much worse explanatory of microbiome diversity than genetic distances of infected hosts. The most important discovery of the presented study is that microbiota communities vary greatly in insect hosts (here using beetles) and that bacteria diversity is shaped by both host phylogenetic relations (in simplicity taxonomy) and trophic affinity. 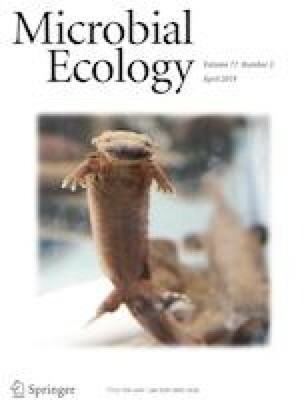 The novelty of this study is that it simultaneously analyses microbiome of numerous taxa on several specimens each, whereas almost all former research [31, 33, 35] was focused on single representatives belonging to a particular taxonomic unit and trophic guild. According to a brief literature search, there are only several studies on microbiome of selected beetles (all listed in the “Introduction”). These previous studies did not allow for comparative analyses. In contrast, numerous specimens are examined in this study at the same time and conditions. They belonged to 24 selected species of beetles from five families and three trophic guilds. It also exceeds the pioneer works of Colman et al. and Yun et al. , which were the only studies that examined microbiome diversity in respect to hosts taxonomy (for various insects) and diet preferences. However, the studies of Colman and Yun, which inspired our work, had some limitations listed above (see “Introduction”), which are overcome in the presented article. Our results indicate that bacterial communities are highly diverse on every level of grouping. Regarding alpha diversity of bacteria found in beetle hosts, a high variability of microbiota in coleopterans was observed on all examined levels, starting from variable number of OTUs found in specimens of particular species as well as various values of diversity metrics on the level of families and trophic guilds. On the species level, it was interesting to detect different values of alpha diversity metrics even between closely related species (from the same genera), which share habitats and diet. Such a situation was observed for four Bembidion ground beetles (e.g., B. decorum has on average 2.5 times more diverse microbiome than B. modestum), Aphodius dung beetles (e.g., A. depressus has on average eight times more diverse microbiome than A. sphacelatus), and Onthophagus dung beetles (e.g., O. taurus has on average four times more diverse microbiome than O. ovatus). The most pronounced example is two sister Crioceris leaf-beetles , with C. quatuordecimpunctata c. 14-fold lower bacteria diversity than C. duodecimpunctata. Kolasa et al. showed that these two species differ also in terms of Wolbachia infection (C. quatuordecimpunctata totally infected, C. duodecimpunctata uninfected), despite feeding on the same host plant. As Wolbachia infection could cause decreases of bacterial diversity (see  for Drosophila melanogaster), the high prevalence of this endosymbiont in C. quatuordecimpunctata could explain its very low diversity of the entire microbiome. The only exception seemed to be Paederus/Paederidus rove beetles, as all four examined species share similar and low levels of microbiome diversity. These differences in bacteria diversity among particular species of beetles are not easily explained due to deficiency of other studies for comparison. Some biases caused by laboratory procedures could not be totally ruled out. However, all conditions (during DNA isolation, amplification, and sequencing) were the same for each specimen. Also, the number of examined individuals were the same within families. It could not be simply explained by different microbiota associated with species hosts, as particular individuals of beetles, even within species, often expressed by very different composition of bacteria. It is interesting that on principal coordinate analyses plots particular specimens are usually intermixed between species. Contrary to this, bar plots (showing relative abundance of bacteria across hosts) suggest that particular beetle species is dominated by one, two, or few bacterial taxa. One explanation for these results could be that it suggests that lack of distinctiveness of microbiota found in members of particular beetle species is caused by a high diversity of low-abundant bacteria. Second possibility is that these few dominating bacterial taxa could be responsible for similarities of beetle hosts if considering them on higher levels (taxonomic or trophic). The majority of beetle species were found to be infected by widespread, usually aerobic bacteria of commensal lifestyle (e.g., Enterococcus (Bacilli), Comamonadaceae (Betaproteobacteria), Enterobacteriaceae and Pseudomonas (both Gammaproteobacteria), Neisseriaceae (Betaproteobacteria) etc.). Enterococcus is a member of Firmicutes, which were found to be dominant bacteria in insect microbiomes . These aerobic bacteria are most common in ground beetles and rove beetles and constitute a substantial part of microbiome in weevils and leaf beetles as well. All four of these groups of beetles are free-living and are associated with various types of fresh foods, either animals (small invertebrates in case of carnivores) or plants (green tissues in case of herbivores). It is interesting that in rove beetles, a high share of bacteria were anaerobic Flavobacteriaceae, Fusobacteria, and Clostridia, which is consistent with the lifestyle of Paederus/Paederidus. These species occupy muddy riverbanks and live within decomposing remains of plants, where aerobic conditions are present. In some species of weevils, aerobic bacteria were present, which could be present on the surface of leaves of their host plants. The presence of these bacteria could be explained in light of findings of synergies in insect-microbe relationships at the interface of plant–insect defenses . Dominant bacteria in many beetles were endosymbiotic taxa, which is concordant with microbiome studies of insects . Wolbachia and/or Rickettsia were especially abundant among some weevils, leaf beetles, and ground beetles, whereas these microbes infected only single members of dung beetles in low frequency. The most interesting results were obtained for Scarabaeidae, the microbiota of which was dominated by Pseudomonadales (mainly Acinetobacter) and Carnobacterium (Bacilli). These bacteria are known from decomposing organic material (like dung or carcasses). This finding is also consistent with the diet of examined dung beetles. Other studies also supported a high prevalence of Pseudomonadaceae in dung beetles [31, 32]. Moreover, some pathogenic bacteria were found in dung beetles such as Pasteurella (Gammaproteobacteria), which are known as zoonotic pathogens and most probably originated from domestic animals (cows, sheep, horses) on which dungs these beetles were collected. Also, other bacteria found mainly in dung beetles, but also in a low share in other hosts, were known as facultative pathogens (e.g., Pantoea, Empedobacter, Enterococcus and others); unfortunately, the only studies which describe their pathogenesis concern vertebrates (e.g., [61, 62]) and data for invertebrates are missing (it is uncertain if only some insects could serves as vectors for these bacteria or could also suffer from their pathogenesis). The aforementioned description of bacteria living in beetles also explains the high dissimilarity between microbiome beta diversity metrics assessed for particular hosts. Despite a great variation of microbiome diversity within species, species from particular families or trophic guilds expressed much greater distinctiveness in their bacterial communities. Various compositions of bacteria in beetle species also causes significant differences if analyzing beetles on higher organization levels. The highest bacteria alpha diversity was found among members of Carabidae and Scarabaeidae; the lowest, among species of Staphylinidae. Simultaneously, all five examined families of beetles possessed substantially dissimilar microbiota (which is expressed by significant differences in beta diversity metrics among these groups). Similar conclusions—that insect bacterial communities are shaped by host taxonomy—were presented by Colman et al. and Yun et al. .
An even bigger association between microbiome and trophic affinity was observed with regard to host diets. Principal coordinate analyses and non-metric multi-dimensional scaling plots showed that members of all three examined trophic guilds (carnivores, herbivores, and detritivores) form distinct units with respect to their bacterial communities. This phenomenon suggests that the trophic affinity of the host is more responsible for microbiome similarities than just host taxonomy (phylogenetic relations). Unfortunately, the sampling structure in this study (high correlation between assignment of beetle species to families and trophic guilds) prevents direct and unequivocal conclusions from being made about the role of phylogeny vs trophy. However, the observed pattern that beetles belonging to the particular trophic guild share their microbial diversity, strongly support the statement that common food resources could be mostly responsible for sharing of bacteria. This is not only consistent with the meta-analysis of insects by Colman et al. and the microbiome study of insects by Yun et al. , but also with studies on mammals. Ley et al. showed that taxonomy as well as host diet are correlated with bacterial community diversity in wild and domestic mammals (including humans). Moreover, a study by Muegge et al. proved that microbial communities adapt to extremes of diet and that this is probably the case in beetles. Indeed, endosymbiotic bacteria are one of the most significant findings of the presented work. So far, only Wolbachia has been known to infect numerous taxa of beetles (see  for a summary). There were also single examples of infection of Rickettsia and Spiroplasma in beetles [22, 29]. Cardinium has not been detected thus far in any beetle species [20, 29]. There have been no reports about the status of Arsenophonus in beetles. Here, thanks to use of next-generation sequencing technology, we have extended the list of endosymbiotic bacteria known from beetle into eight taxa with new finding for six bacteria: Cardinium (found only in one species of ground beetle), Arsenophonus (found only in one species of ground beetle), Buchnera (found in nine hosts), Regiella (two hosts), Serratia (three hosts), and Sulcia (two hosts). All these six, newly detected bacteria were only found in very low frequencies in some individuals of particular beetle species. Therefore, it is not possible to make any conclusions about their potential effects of beetles (this is outside the scope of this article), but it is known that Buchnera and Sulcia are mutualistic, whereas Regiella and Serratia are commensalistic . Cardinium and Arsenophonus, as well as Spiroplasma, Rickettsia, and Wolbachia, were considered to be either parasitic or symbiotic . It is worth mentioning that all beetle species, which have been recently reported to be infected by Wolbachia with the use of traditional Sanger sequencing and multilocus sequence typing genotyping [47, 48, 49, 60, 66, 67], were also found to be infected in this study (they have a large number of Wolbachia reads in Illumina sequencing). It is interesting that the collected data reject the hypothesis that endosymbiotic bacteria from particular genera inhabits hosts interchangeably, which would explain the effect of some competition between taxa having similar effects on the hosts  (all these bacteria described above are transmitted transovarially ) and all these most abundant are known as “male-killers” . Obviously, these different bacteria could live together in the same host while there are no relations among them, which could change their abundance with respect to prevalence of other bacterial taxa. The lack of a visible effect on relative abundance does not say much about other possible relations between these bacteria in multiple infected hosts. Further research is needed to investigate possible effects among various endosymbiotic bacteria, other microbes and their hosts. Another result worthy of highlighting is that this study only weakly supports the assumption that a higher abundance of endosymbionts decreases diversity of the whole microbiota . Apparently, the association between the number of endosymbiotic bacteria and alpha diversity of other bacteria is not straightforward, and other factors could be responsible for the lower richness of bacteria in, e.g., Wolbachia- or Rickettsia-infected hosts. Also, this finding should be verified in further research. 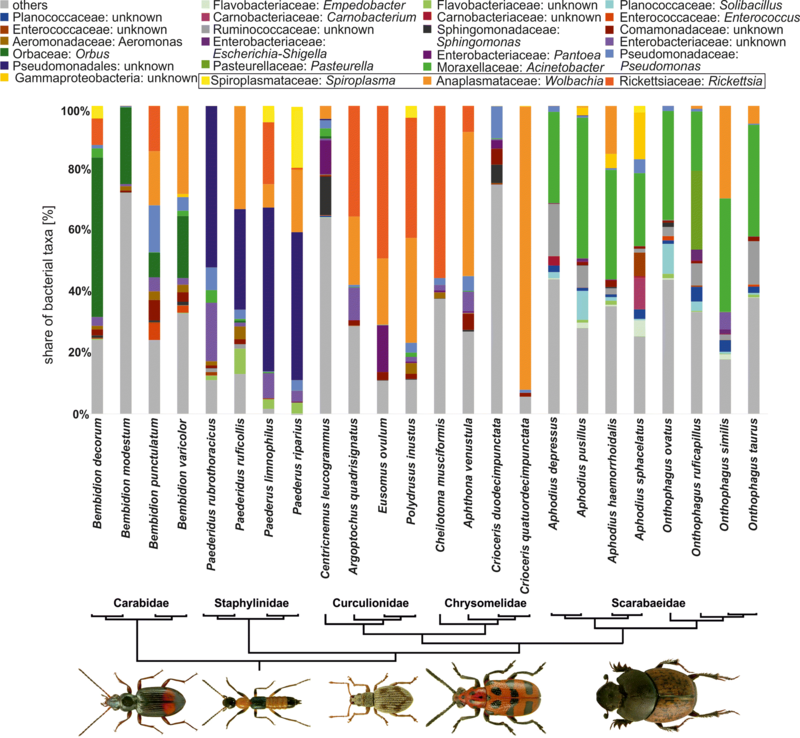 This last finding is supported by multivariate analyses, which indicates that endosymbiotic bacteria abundance is less responsible for microbiome diversity than phylogenetic relations of infected hosts (expressed by genetic distances among examined beetles). In summary, this study rejects the hypothesis that overall on the individual level, beetles possessed more similar microbiota within species than between taxa. However, even if most beetle hosts (individuals) vary greatly, there are some beetle species, the members of which are infected by unique bacteria communities. Such communities made their host distinguishable from others. Contrary to the high intermixing of microbiota found on the individual level, there are much clearer differences of bacterial communities found in particular groups of beetles considered on higher taxonomic levels (within family). The greatest distinctiveness was observed among beetles grouped according to their trophic requirements. This finding supports the conclusions of other studies. Microbiome is shaped by both phylogenetic relations (in simplicity—taxonomy) as well as trophic affinity, and that the latter better explains differences among groups of infected hosts. Moreover, this study greatly extends knowledge about endosymbiont prevalence in Coleoptera, supporting infection by not only common Wolbachia, Rickettsia, and Spiroplasma, but also other bacteria such as Cardinium, Arsenophonus, Buchnera, Sulcia, Regiella, and Serratia. The obtained results do not support the interchangeability of endosymbiotic bacteria in beetle hosts, and suggest only weak decrease of microbiome diversity in taxa highly infected by endosymbionts. The authors are grateful to Wiesław Babik for his help in research conception design, preparation of data for analysis, and suggestions to draft of the manuscript; to Piotr Łukasik for his important comments to the draft of the manuscript; and to two anonymous reviewers for helpful comments and suggestions, which allowed for substantial improvement of the article. The authors thank two people who identified specimens of the species for some groups (Marcin Józefczyk and Łukasz Minkina). The authors kindly thank Prof. Lech Borowiec for providing the pictures of beetles from his ICONOGRAPHIA COLEOPTERORUM POLONIAE (© Copyright by Prof. Lech Borowiec, Wrocław 2007–2018, Department of Biodiversity and Evolutionary Taxonomy, University of Wroclaw, Poland), which were used for preparing some of the graphics. This research was partially funded by the grant DEC-2013/11/D/NZ8/00583 (Kajtoch Ł., National Science Centre, Poland) and by small grants for young researchers (Kolasa M., Polish Ministry of Science and Higher Education). No data have been fabricated or manipulated (including images) to support the conclusions. No data, text, or theories by others are presented. The authors declare that they have no conflict of interest. This study did not involve any protected animal species and any vertebrates. Informed consent was obtained from all individual participants included in the study. The manuscript has not been submitted to any other journal for simultaneous consideration and has not been published previously (partly or in full). This single study is not split up into several parts.